President Barack Obama and other US officials are receiving criticism for not attending Saturday’s ‘Unity March’ in Paris. 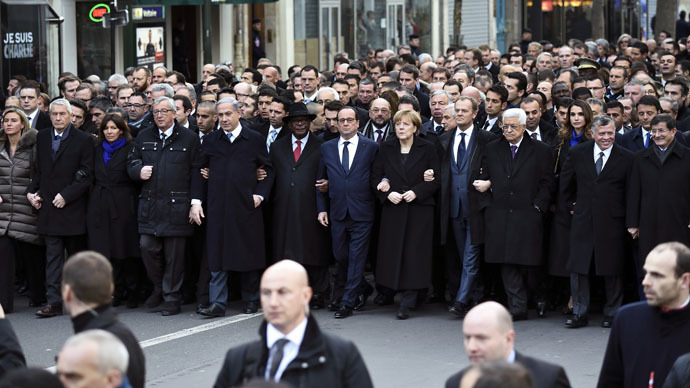 The rally included more than 40 world leaders who showed solidarity with 17 victims of multiple attacks last week. Jane Hartley, the US ambassador to France, was the highest-ranking US official to attend the rally. The event occurred four days after an assault on the offices of Charlie Hebdo satirical newspaper in Paris left 12 dead. Despite the ambassador’s presence, the absence of the Obama administration’s heavy hitters rankled America’s conservative press. “The United States of America, Barack Obama, President, was inexcusably absent from one of the most critical turning points in the war between radical Islam and the West since 9/11,”wrote the editorial board of the New York Daily News. Attorney General Holder was in Paris at the time of the rally, but was scheduled to attend top security meetings during the weekend, according to reports. US Sen. Marco Rubio, a possible candidate for the Republican presidential nomination in 2016, said Sunday on ‘CBS This Morning’ that it was a “mistake” for the Obama administration’s top officials to skip Paris. "I understand that when the president travels, he brings with him a security and communications package which is intense. And I understand you drop that into the middle of something like this, it could be disruptive," Rubio said. "There’s a plethora of people they could have sent. I think in hindsight I hope that they would have done it differently." 40 WORLD LEADERS.. March arm in arm dramatically and historically in Paris... OBAMA ABSENT...He has made the American Presidency.. A Joke!! On Monday, White House Press Secretary Josh Earnest bowed to criticism of the administration's decision. “I think it’s fair to say that we should have sent someone with a higher profile to be there,” Earnest said, though he did not detail what Obama was doing during the rally, nor why Holder could not take time to attend while he was in Paris. Previously, a White House official told CNN that security requirements for President Obama and Vice President Biden "can be distracting,” while another official told the network that the US has been involved on "essentially a minute-by-minute basis" with French officials since the attack. The White House also announced over the weekend that a counter-terrorism security conference would be held next month. President Obama, meanwhile, visited the French Embassy in Washington on Thursday, according to The Washington Post, signing a book of condolences while there. "On behalf of all Americans, I extend our deepest sympathy and solidarity to the people of France following the terrible terrorist attack in Paris," Obama wrote. "As allies across the centuries, we stand united with our French brothers to ensure that justice is done and our way of life is defended. We go forward together knowing that terror is no match for freedom and ideals we stand for – ideals that light the world. Vive la France!" In a column for FoxNews.com, Democratic strategist Doug Schoen summed up some of the more biting invective aimed at the Obama administration, saying the president "morally abdicated his place as the leader of the free world." Not attending the rally, Schoen wrote, "sent a clear message to the world: Obama just doesn't care." Obama "is the only Western leader who has refused to call this attack Islamic terrorism, even though President Hollande has declared that France is it at war with radical Islam,” he added. US Secretary of State John Kerry dismissed criticism of the absence of a top US official on Saturday. "I really think that this is sort of quibbling a little bit in the sense that our Assistant Secretary of State Victoria Nuland was there and marched, our ambassador [to France Jane Hartley] was there and marched, many people from the embassy were there and marched,” Kerry said Monday, according to Fox News. Nuland attended a march in Washington, Fox noted. Kerry attended high-level meetings in India over the weekend. "I would have personally, very much wanted to have been there, but couldn't do so because of the commitment that I had here and it is important to keep these kinds of commitments," he said, according to the Daily News, adding that the US-France alliance "is not about one day or one particular moment." Kerry did announce, though, that he would be in Paris later this week. "That is why I am going there on the way home and to make it crystal clear how passionately we feel about the events that have taken place there. I don't think he people of France have any doubt about America's understanding about what happened, about our personal sense of loss and our deep commitment to the people of France in this moment of trial." French President Francois Hollande led Saturday’s Unity March, linking arms with top world leaders including German Chancellor Angela Merkel, Israeli Prime Minister Benjamin Netanyahu, Palestinian President Mahmoud Abbas, British Prime Minister David Cameron, and Russian Foreign Minister Sergey Lavrov. French media estimated that up to three million attended solidarity marches in Paris over the weekend. The march led by Hollande started at Place de la Republique and headed towards Place de la Nation, approximately three kilometers away. “Speaking to some of the hundreds of thousands of demonstrators who have descended on Place de la Nation here in central Paris today, really two almost distinct sets of sentiments and messages are being expressed,” RT’s Harry Fear reported from Paris. Twelve people, including four notable cartoonists, were killed in the first attack on Wednesday by suspected gunmen Cherif and Said Kouachi. The attacks have since come to symbolize a non-violent fight for freedom of expression across France and the world. On Thursday, a policewoman was gunned down in the French capital by a man named Amedy Coulibaly. The man later took hostages in a kosher store in northeast Paris, killing four people on January 9. The Kouachi brothers and Coulibaly were killed by French police in two separate operations on Friday. Wingnuts, last month: "The Secret Service isn't doing its job!" This month: "Who cares what Secret Service says, Obama should be in Paris."